Fertilize with an all-purpose houseplant fertilizer at recommended rates. 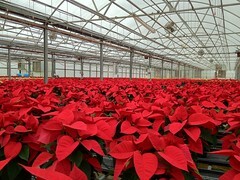 Continue to provide adequate light and water for prolonged bloom for several weeks. Check your plant for signs of insects such as white fly and treat if needed. If your plant has become long and leggy, cut back to about five inches tall. Remove faded and dried parts of the plant. Add more soil, preferably a commercially available sterile soil mix. Keep the plant in a very bright interior location. Trim off two to three inches of branches to promote side branching. Repot to a larger container using a sterile growing mix. Move the plant outside for the summer; place in indirect light. Trim the plant again. Move it into full sun. Continue to water and fertilize but increase the amount to accelerate growth. Move indoors to a spot that gets at least six hours of direct light daily, preferably more. As new growth begins, reduce the amount of fertilizer. Starting on or near Sept. 21, give the plant 13 hours of uninterrupted darkness (put the plant in a closet, basement, or under a box) and 11 hours of bright light each day. Maintain night temperatures in the low 60 degree F range. Continue to water and fertilize. Rotate the plant daily to give all sides even light. Discontinue the short day/long night treatment. Put the plant in a sunny area that gets at least six hours of direct light. Reduce water and fertilizer. Enjoy your "new" poinsettia. Start the cycle all over again. Uncle Jim's Almanac: Who is Uncle Jim?